Thank you, Perkins, for being open Christmas Day. I know that sounds bad of me. Why didn’t I cook? Why didn’t I spend the day with family? Why am I going out to eat on Christmas? Well, let me answer those questions. I’m lazy. Our families are snowed in at home in Illinois. I’m lazy and didn’t feel like cooking. There. Does that answer those questions? We knew our choices were going to be limited on Christmas Day and I hadn’t heard of any local places being open. 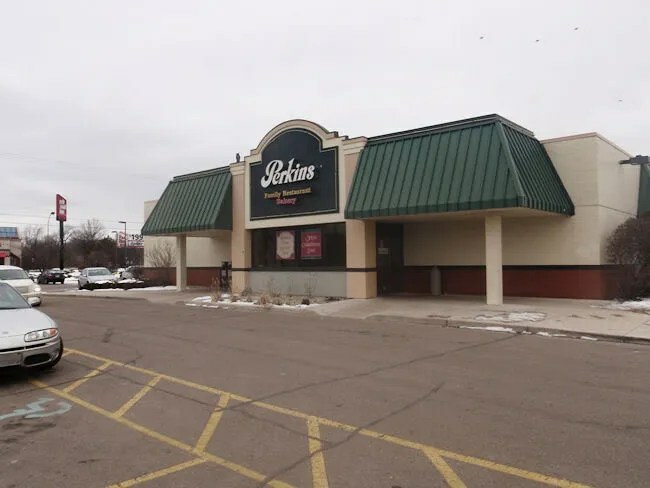 Of the chains that were open, Perkins sounded the best to me. The Kalamazoo location of Perkins Family Restaurant & Bakery is on the corner of Sprinkle and Cork in Kalamazoo’s Milwood Neighborhood right near the I-94 Exit. I wasn’t 100% sure that the restaurant was actually open, so I was really happy to see quite a few cars in the parking lot. Looks like I wasn’t the only one who didn’t feel like cooking today. We walked in right around noon and were greeted by a hostess who took us to a booth in the back of the restaurant. Like I just mentioned, the restaurant was pretty full. The dining room has some odd sectioning walls and we were seated right behind one. It sort of divided the space into a separate room. There was a larger party seated a table right next to us which I was afraid was going to be a problem, but it really wasn’t. Had it been three in the morning instead of 1:00 on Christmas Day, they might have been a little rowdier. We started out with a Coke and an Iced Tea to drink while we looked over the menu. Breakfast foods were still an option, but we both went for the lunch menu. I didn’t see any reason to drift from my usual routine just because it was Christmas. I ordered the BBQ Bacon Supreme Burger. 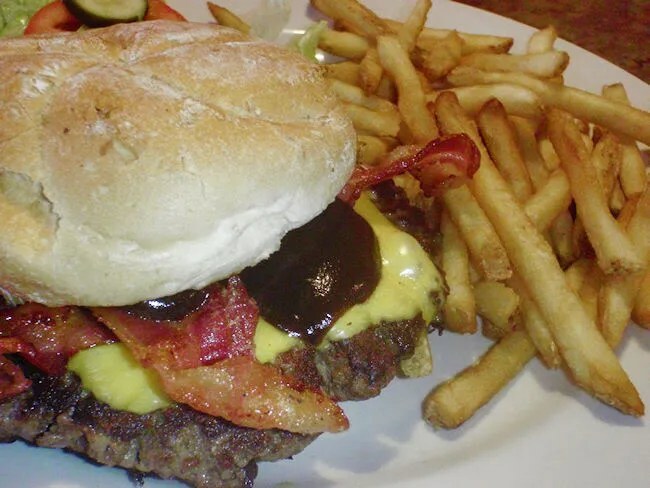 The ground chuck burger is topped with smoked bacon, American cheese, a tangy BBQ sauce, lettuce, tomato, and pickles. Like most family chains, they overcook the burgers to a medium well, so the meat was a little dry, but other than that, it was actually a pretty good and filling burger. The bacon is nice and crispy and the sauce is a pretty thick sweet concoction. The sandwich comes with a choice of sides and I went with the fries. Surprisingly, they’re skin on fries that only needed a little more salt when they got to the table. Overall, it was a pretty decent meal and better than anything I would have whipped up at home. J also didn’t let the holiday distract her from her normal routine. She ordered the Buffalo Wrap. 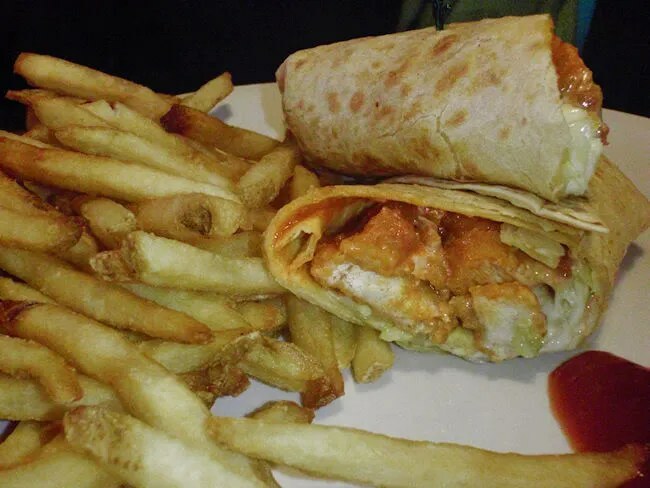 The Roma tortilla is filled with crispy chicken that has been coated in a buffalo sauce, lettuce, Pepperjack cheese, and a bleu cheese sauce. She hasn’t really been filling too hot since about the middle of last week. Her nose is pretty stuffed up and that affected her sense of taste. She ordered the Buffalo chicken hoping it would clear up her nose. It may have a little bit, but the chicken was too hot for her. She ended up giving half to me for later which I gobbled up for dinner. I really liked it and didn’t think it was all that hot. It was sort of on par with Frank’s Red Hot. She did, however, enjoy the fries. She cleaned her plate of the same skin on fries that I got with my sandwich. We decided to take dessert to go. We were both pretty stuffed, but it is a holiday, right? So we gotta have dessert. 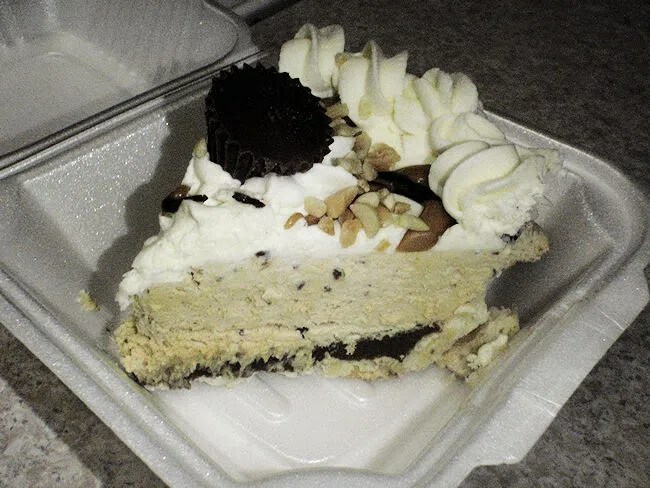 We ordered two slices of the Peanut Butter Silk Pie which was brought to us in individual to go containers. It was a few hours before we got to them and they were delicious. The pie is a hard chocolate ganache, Reese’s peanut butter silk, real whipped cream, and mini peanut butter cups. Again, delicious. Our bill with the two slices of pie was around $25. Not bad at all. I can’t recall ever eating at a Perkins before, but J said she used to eat there all the time when she lived in Idaho Falls. The atmosphere is pretty consistent with a local family diner with just a little bit of the chain feel. The food is pretty solid and the desserts were delicious. We overheard a waitress tell another table that this is only the second year that Perkins was open on Christmas. I’m happy they were and by the look of the dining room, we weren’t the only ones. I wish I would have known this was open– we did chinese food on christmas day because we didn’t think anything else was open! I wasn’t 100% sure if they were or not, but I knew Denny’s was so if Perkins wasn’t, we could have just went across the street.